Most Financial Advisors would consider 18 leads in 1 month, a KILLER month! Home / Business Growth / Most Financial Advisors would consider 18 leads in 1 month, a KILLER month! Sadly, most Advisors are not talking to more than 2 – 3 qualified prospects per month and need/want more high-quality people to talk to EVERY week. 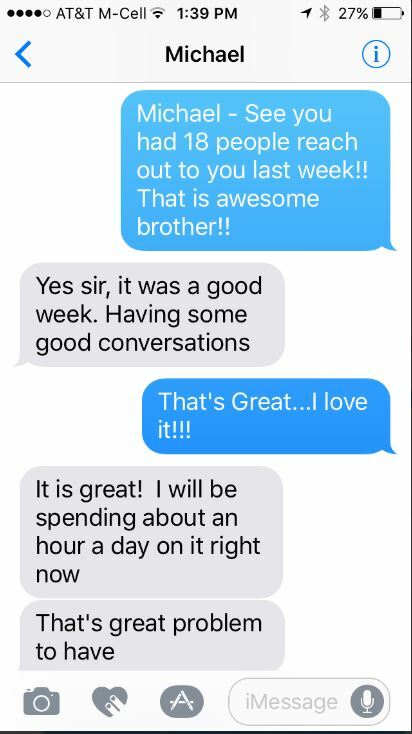 Today, I shared this text exchange with my client who had 18 people reach out to him last WEEK! If you’re not talking to at least 3 – 5 qualified prospects EVERY week, you are marketing the WRONG (hard) way. If you still go to bed every Sunday night wondering how you are going to generate qualified leads, you are marketing the wrong way. If you can realistically handle 3 – 5 phone calls and/or face-to-face meetings EVERY week with your ideal prospects that reach out to you directly – send me a PM. Next For Financial Advisors who want to talk to more Ideal Prospects every week.